Found in the Western Atlantic, from Bermuda to Brazil. Once mature, the males have pouches on their abdomen, the females have none. They will do best in species tanks. Fast aggressive fish must be avoided. 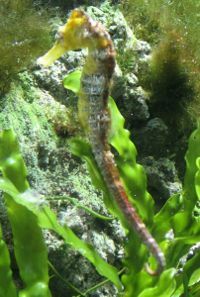 Peaceful community fish may out-compete the Seahorse to food. Clams must also be avoided as they might close on the Seahorse. Crabs and hermits can damage this fragile fish. An ambush predator, they will not hunt for food around the tank and are best target fed with foods such as frozen mysis shrimp, krill or red shrimp. Some may be fussy and take only live food. Feed these fish twice a day, target feed. Needs an SG of 1.020-1.025 and a tank at least 16" high. The tank should be mature and the water quality should be excellent. There should not be too much current and plenty of décor for the Seahorse to hang on to. Peaceful fish, like most seahorses, not overly active and slow swimmers. Will spend their days snuffling for food and interacting with other seahorses. This fish is coloured in various shades of yellow, from red to mustard yellow, often with darker spots across the body. This page was last edited on 13 December 2017, at 03:08.